As the standoff between US President Trump and the Democrats continues, there is one member of Congress who has made it clear that the left will not back down. “This manufactured crisis can only end when the White House decides they have to give up on their fantasy wall,” said Minnesota Congresswoman Ilhan Omar in an exclusive interview with TRT World. 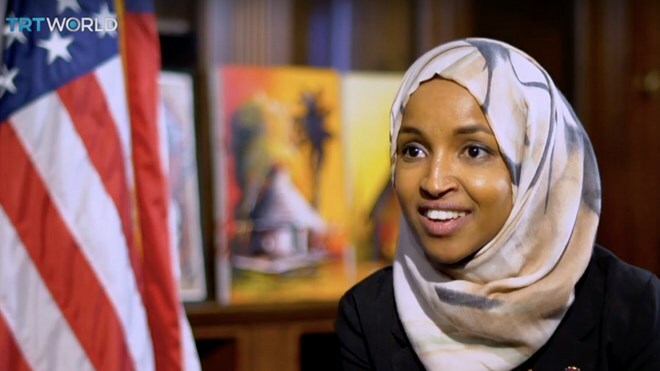 Somali-American Ilhan Omar, 36, won a seat for the Democrats in Minnesota in last year’s November midterm elections – one of the first two Muslim women ever to sit in the House of Representatives. Ilhan Omar fled Somalia’s civil war with her family when she was just eight years old. After living in Kenya, she finally made it to the United States as a refugee at the age of 12. She became a US citizen when she was 19 years old. In her first interview since she was sworn in, Omar discusses the government shutdown gripping the US with TRT World’s Alican Ayanlar. The full interview will air on Sunday, January 13, 2019.